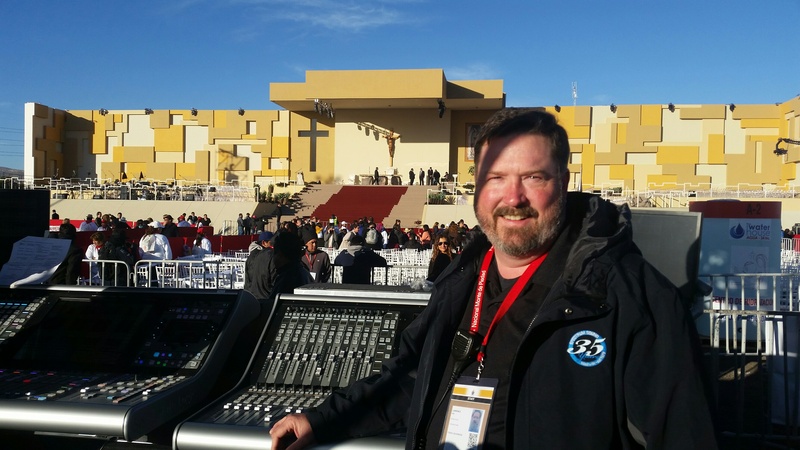 School of Music Facilities Manager Rusty King recently returned from a trip to Mexico where he facilitated the audio plan for Pope Francis’s visit to Juarez, Mexico. Because King has been involved with at least two other Papal visits previously, he said the call to serve alongside the Pope’s team didn’t come as a surprise. “The planning for these events is huge—it’s key,” King said. “When 500,000 people are expected to show up for the Pope, it effects an entire city, state and country!” Prior to the team’s arrival, drawings of the venue for the Pope’s visit were sent out to prepare the team for providing sound to cover 400,000 people on the main stage, a large parking lot and a small soccer stadium. King said he had been involved in planning phone calls with his audio, power and signal vendors for the full month leading up to his departure for Mexico.